PAGEONE wins another global award – the Gold Quill Award from the prestigious International Association of Business Communicators (IABC) to be given in Vancouver, Canada this June. This was announced yesterday by the IABC in its website and through notices sent to all entrants. According to the Gold Quill Awards 2019, out of the 638 entries reviewed by more than 250 evaluators this year, 202 were selected as world-class entries because they met the stringent criteria. Eighty-six entries earned an Excellence award and 116 garnered a Merit Award. This year’s winners came from only 10 countries including the Philippines. Only five entries from the Philippines won. 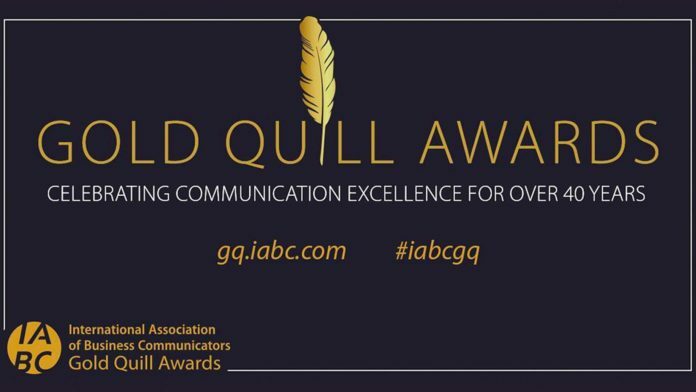 The 2019 Gold Quill Excellence Gala is scheduled on June 11, 2019 in Vancouver, British Columbia in Canada during the IABC World Conference. This global recognition came in the heels of the agency’s multiple awards in the recent Anvil Awards of the Public Relations Society of the Philippines, where PAGEONE won its 3rd Agency of the Award, 3rd Grand Anvil Award, and 3rd Platinum Award. To date, the four-year old agency has already earned more than 100 metals in award-giving bodies in the Philippines, Singapore, Hong Kong, Japan and Canada. “This latest global recognition is another testament to the excellence and creative genius of the men and women of PAGEONE Group. We are thankful for the continuing trust and confidence of our clients and partners in our pursuit of communication excellence,” PAGEONE president Vonj Tingson said. PAGEONE is the digital-oriented agency of the PAGEONE Group, which also houses an international integrated marketing communication agency and a professional development firm. PAGEONE is behind some of the popular digital platforms PageOne.ph, Woman.ph, Journey.ph, Politico.ph, TheLuzonDaily.com, The VisayasJournal.com, and TheMindanaoLife.com.